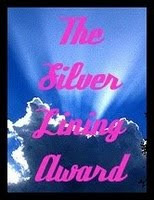 The beautiful and talented Carol Miller has given me an award for my blog! I’m so honored that she thought of me, and grateful for the publicity. If you get a chance, go by Carol’s blog and check out what she’s got to say. I promise, it will be more than worth your time. Fantastic writers with great things to say, all of them. You won’t be disappointed! I don’t know where I’ve been that would have prevented me from hearing about Carol and Simon‘s Cosmic Coincidences short story contest, but somehow, I missed it. Maybe it’s because I spent the past month moping around and burying myself in the editing process until I nearly suffocated. Anyway, they’re having a contest! And it ends on January 31. I really want to enter it, and if you like to write, then you should, too! If you’re interested, click here for the rules and here for the prizes you could win. Alright, that’s all for today, everybody. Happy Tuesday! I'm off to check out the other winners. Thanks again. How very sweet! Thank you so much! I shall post about it tomorrow. Sorry Lynnette! Yikes! I know how that feels. People are always leaving the E off my name. Will fix it right now! You're welcome, Heather! Much deserved. Sara, I know, me too. I started it today but I probably won't end up sending it in until like 5 minutes before the deadline. Congratulations on the award, good lady. And yay you for talking up our contest! You're the coolest! Simon, I only hope you find me worthy of your contest! I'll do my best, but keep in mind I'm a newbie at this short story thing. THANK YOU! I'm sorry that today has kept me from saying thank you until now. Shannon – thanks, and you should definitely enter the contest! Boudreau – you are so welcome! And no worries… today was pretty crazy for me too! I intend to enter Simon & Carol's contest – but I haven't written a word yet. *sigh* Really have to squeeze in some time for that!! Congrats on the award, Anne! You deserve it. And thank you so much for passing it on to me! I'm glad to see you coming out of the editing mopes. All things come to an end (good and bad) but it's better when the bad stuff is over. Thanks DL! I appreciate it! Jemi, I haven't written much yet. I've got to work on it today so I don't end up procrastinating and then frantically trying to get it done at the last second, as is my usual modus operandi. And I have no idea if I spelled that right or not. Thanks, Lorel! It is very nice to come out of the editing mopes. That is the perfect word for it! And you're right, the new picture is much lighter, I didn't even think about that! Ha!